When tapas burst onto the American dining scene a few years back, they confused as many people as they enthralled. It was as if a mass forgetfulness had taken hold, as trendy restaurants from New York to Los Angeles obviously forgot to print the “entrée” sections of the menus they handed their patrons. Appetizers only? Really? Fortunately, the befuddlement subsided as diners grew more accustomed to the charming trend of “small plates”, which encourage sharing and tasting many different items, rather than ordering one substantial offering per person. But American tapas are a bit different from their Spanish progenitors. In Spain, where dinner is usually served from 10 pm to midnight, tapas are most often eaten in late afternoon for the mereinda, or after-work snack; whereas Americans most often eat their tapas as an entire meal. Wine and tapas go hand-in-hand, not only because of the thrilling and endless wine-pairing possibilities inherent, but also because tapas were originally created in conjunction with wine drinking. There are as many stories about the origins as there are types of tapas, but it’s generally said that glasses of wine or sherry began to be served with a covering (or tapa) of some sort, either a plate or a slice of good cured ham depending on the tale, in order to keep fruit flies from plunging happily into the sweet-smelling beverage. Bars and restaurants in competition began turning out better and more elaborate versions, until tapas became the phenomenon that they are today. Tapas are typically divided into hot and cold categories, and can be as simple as a plate of olives or as elaborate as any entrée. Regional specialties are usually showcased, such as sliced cured ham in Salamanca, octopus in Galicia, or Manchego in La Mancha. But no matter where you are in Spain, or what you’ve decided to nibble at over your Rioja, you’ll always find bread served alongside. That’s where today’s bread comes in. 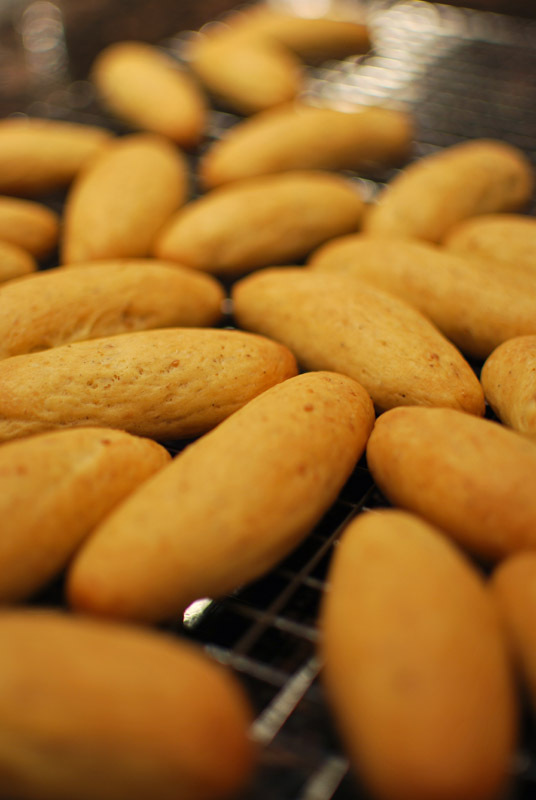 Picos are hard little breadsticks that look rather like fat, miniature baguettes. The name “pico” means “beak”, and they do look a bit like a bird’s beak, especially after one too many glasses of jerez. They can be served alone, much like peanuts at American bars, or with some sort of dip or spread, such as tapenade. Served with a slice of jamón ibérico, they’re painfully addictive. I’ve used toasted and ground sesame seeds in this recipe, which is perhaps less than traditional for picos in general, but the result was so flavorful, I wouldn’t suggest trying them any other way. The sesame seeds bring a unique nutty, almost acidic, quality to the dough, but remains as a pleasant background note, while a generous amount of black pepper growls at the back of your throat as you crunch. As easy as these picos were to make, I can’t see not making these for any sort of cocktail party, though I might refrain from serving the showy things at a wine tasting, where they would certainly steal the limelight from the real star of such an event. Instead, set out a plateful next to some meaty Manzanilla olives, or buttery Marcona almonds, and watch as they vanish before your eyes. With appetizers like this, who needs entrées? 1. In a mortar and pestle or spice grinder, crush or grind the sesame seeds until broken up, but not made into a paste. Add to the flour, along with the yeast, salt, and pepper, and whisk until combined. 2. Add the water and olive oil, and stir until a rough dough forms. Turn out onto a work surface, and knead until smooth, about 3 to 5 minutes. Dust with flour as needed to prevent sticking. Transfer to a lightly-oiled bowl, cover tightly with plastic wrap, and let sit at room temperature for about 1 hour, or until nearly doubled in size. Alternatively, you can refrigerate the dough at this point for up to 24 hours. Let come to room temperature for about 1 hour before proceeding. 3. Line a large baking sheet with parchment paper. Turn the dough out onto an un-floured work surface, and knead a few times to deflate. Divide the dough into two even halves, and roll each out into a thick rope. Cut each rope into 12 to 15 pieces. Keeping unused pieces covered, roll each piece between your hands into a round ball. Cover loosely with plastic wrap, and let rest on the counter for 10 minutes. Preheat the oven to 375º F.
4. After resting, roll each ball out between your palm and the counter, into a short, fat log with tapered ends, each about 3 inches long. Transfer to the prepared baking sheet, cover loosely with plastic wrap, and repeat with the remaining dough. Let sit at room temperature for 45 to 60 minutes, or until puffy and nearly doubled in size. 5. Bake at 375º F for 25 minutes, or until golden brown. For picos with a slightly tender interior, remove from the oven immediately, and transfer to a cooling rack. 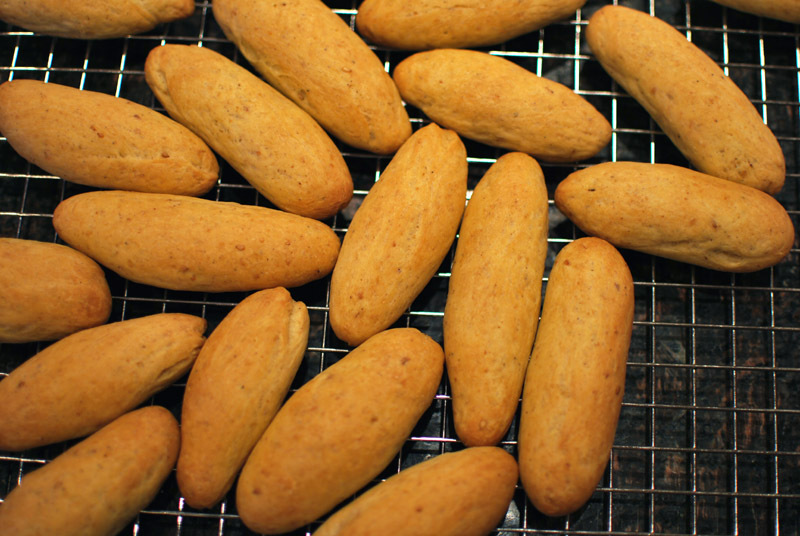 For a totally crisp breadstick, turn the oven off and leave the picos in it for about 1 hour longer. Serve warm or at room temperature. 1. Picos may be kept at room temperature in an airtight container for about 1 week. They may also be wrapped tightly and frozen, reheating in a 350º F oven for about 5 minutes. 2. This recipe makes fairly large picos, but feel free to make smaller ones if you prefer. You may find smaller ones easier to eat, especially if you make them very dry and crunchy. I estimate this recipe could make about 50 to 60 small picos, about 1½ inches long. 3. If you prefer a whole grain version, I don’t see any problems with substituting whole wheat flour for all of the bread flour. If you want the best of both worlds, try using white whole wheat flour instead.